back when i was a kid, my mother was filming my brother and i (about 3 & 4 years old at the time) as we decorated our christmas tree with ornaments. looking back, there's a shot of my brother on a step-ladder, reaching up as high as a four year old could, to place an ornament near the top of the mid-sized tree. he loses his balance for a moment, dropping the glass ornament as he catches himself from falling. CRASH! the ornament hits the floor and shatters. this is all captured on video. however, as soon as the ornament breaks, my brother turns to the camera and screams, "lexi did it!!" the video pans to me in my footie holiday pajamas, minding my own business as i stood there watching -- not being very productive, but definitely not dropping ornaments on the floor. for my 4 year old brother, his diversion of blame was pretty clever, even cute. 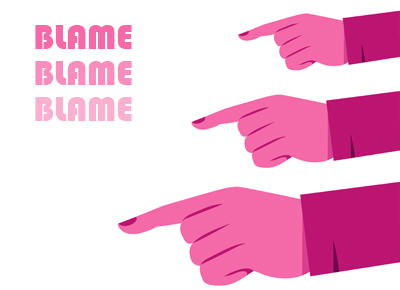 but to divert blame as a mature individual -- nope, not so cute anymore. a waste of energy is more like it. you, and you alone, are 100% responsible for your own life. same goes for me; same goes for everyone else. no one but ourselves should take the blame for the status of our grades, the quality of our relationships, the state of our health, our jobs ... everything! every result and every output is your responsibility. is everything that happens completely under your control? yeah right. but how you respond to your circumstances sure is. it's not someone else's responsibility to make you happy, to get you an A in class, or to make sure the boss gets the report he requested from you in on time, or to even make you feel fulfilled in doing your life or responsibilities. it's also no one else's fault if you fail to do these things. there's no one coming to the rescue but you. once we accept personal responsibility for our own situations, and decide to hold ourselves accountable for every aspect of our lives -- we can much more effectively create our experiences or situations to be the way we want them to be. blaming bad PR, jerky people, or crummy facilities doesn't do yourself one bit of good. what's much more effective is using that energy to collect the pieces, and proactively work to create the results you desire. you know what you would like to accomplish. you have an idea or even a clear picture of what it takes to achieve it. accept that it's your responsibly to get there, and decide that you are going to make it happen, no matter what happens in between. "if it's meant to be, it's up to me."